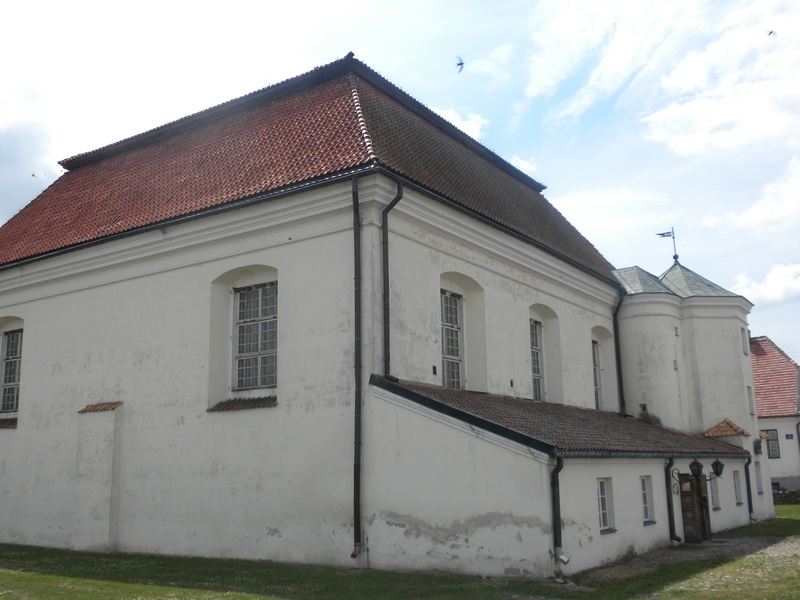 The synagogue in Kazimierz Dolny. 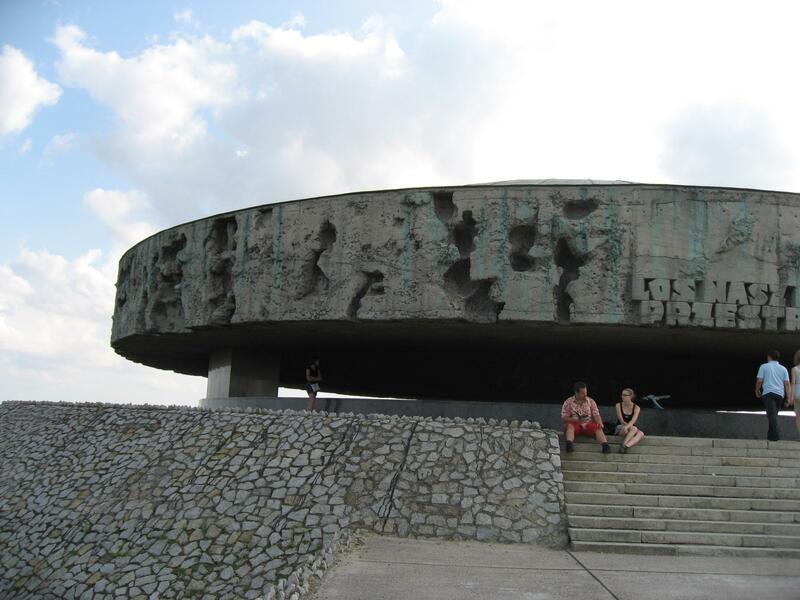 We left the Warsaw area to travel east toward the concentration camp Majdanek, which is right outside of Lublin. During our journey we stopped at Kazimierz Dolny, a quaint Polish town that is now a popular day-trip destination for Poles and was once home to a sizable Jewish population. 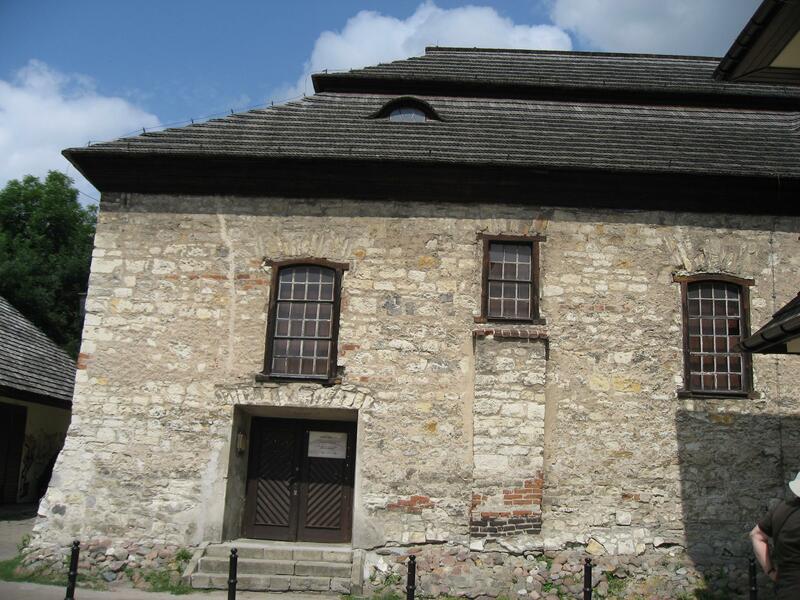 One of the attractions of Kazimierz Dolny is the town synagogue, which is still in tact although no longer functional. It is only very recently that historic Jewish sites are now of interest in Poland. We continued on toward Lublin, which we learned is actually a very old German city that was German-controlled for a time. When the German army declared war on Poland in 1939 and began their military campaign to control Europe, they re-conquered Lublin. They thought that Lublin would be a critical strategic city, or a military “hinge” for conquering areas northeast and southeast of Poland. For this reason, Majdanek was set up nearby as a concentration camp where prisoners would work to support the German war effort. Majdanek was one of the first camps to be liberated, and some of its buildings have remained in tact and have been preserved. This preservation has enabled visitors to develop an idea of what a concentration camp looked like, but there is still no way that we can imagine what life in the camp was actually like, or how horrifying the camp was when it was operational. The grounds itself are chilling; the fact that the camp so closely resembles how it once looked makes it a very upsetting place to visit. Our group walked into a few of the barracks that now function as exhibits. One barrack that holds thousands of pairs of prisoners’ shoes was particularly moving. Tragically this barrack caught fire shortly after our return home, and many of those important shoe-artifacts were destroyed. Majdanek was one of the six death camps, and we know that Jews were put through extreme torture and suffering, and that 75,000 died there. This fact is reinforced by the camp’s ashpit, which still holds the ashes of former prisoners. Looking at the ashpit is a disturbing reminder of the thousands of families who were completely wiped out and reduced to nothing but ashes. Our group left Majdanek in silence, unable to speak about the unsettling experience of visiting the camp. Professor Robert Jan van Pelt teaching us about the structure of the Tykocin synagogue. In the background is the central pulpit, a feature of older synagogues in Eastern Europe. afford prayer books could read along. 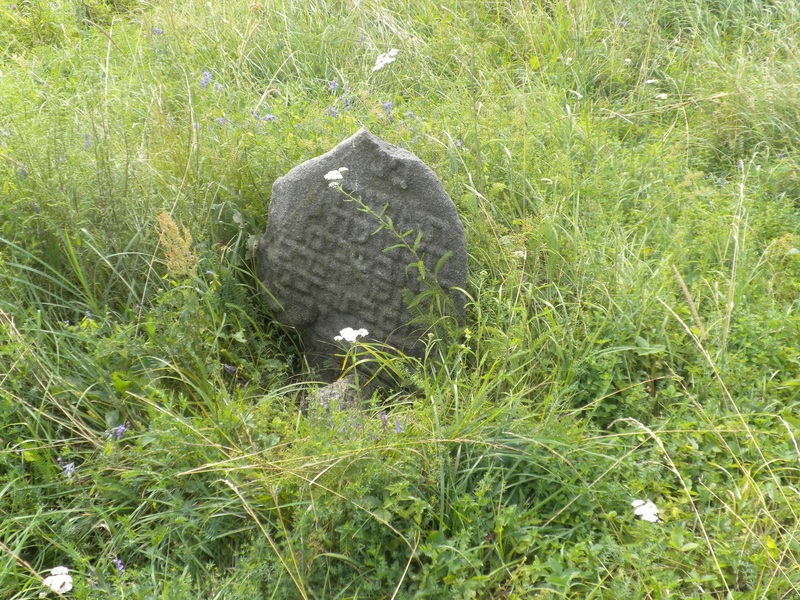 Additionally, we visited the Jewish cemetery in Tykocin, which is almost undistinguishable because most of the gravestones were destroyed and all that remains is an overgrown field. Professor Robert Jan van Pelt then told us about how all of the Jews in the town were rounded up in the square, with the message that they were being relocated. There was no way for these Jewish people to know what was to come. Professor Robert Jan van Pelt then guided us through an experiential exercise, where our group traced the steps of the Tykocin Jews by following their exact path on a silent bus ride to the nearby forest. We then walked slowly down a path in the lush, green woods to an unknown destination. At the end of the path we realized there was a mass grave, and we learned the horrifying fate of the Tykocin Jews. The contrast of the mass grave with the bucolic forest was surreal and disturbing; the Jews of Tykocin were murdered on a similar summer day. We lit memorial candles for these people, and thought about the generations of Jews whose lineage ended in this spot. We then continued to the Treblinka death camp, a place of absolute horror where between 770,000-925,000 people, mostly Jewish, were murdered. The camp was only operational for a brief time, and operated on a very low budget. 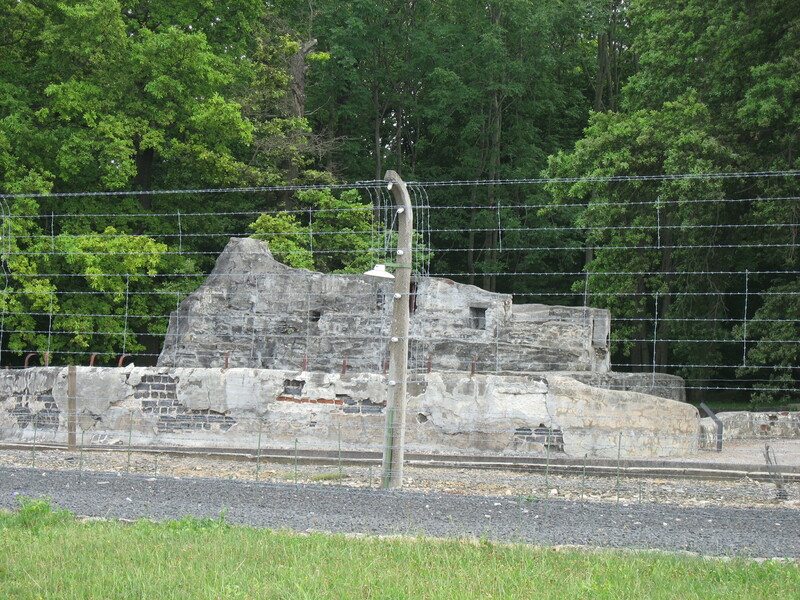 The camp site was destroyed by the Germans in the fall of 1943. 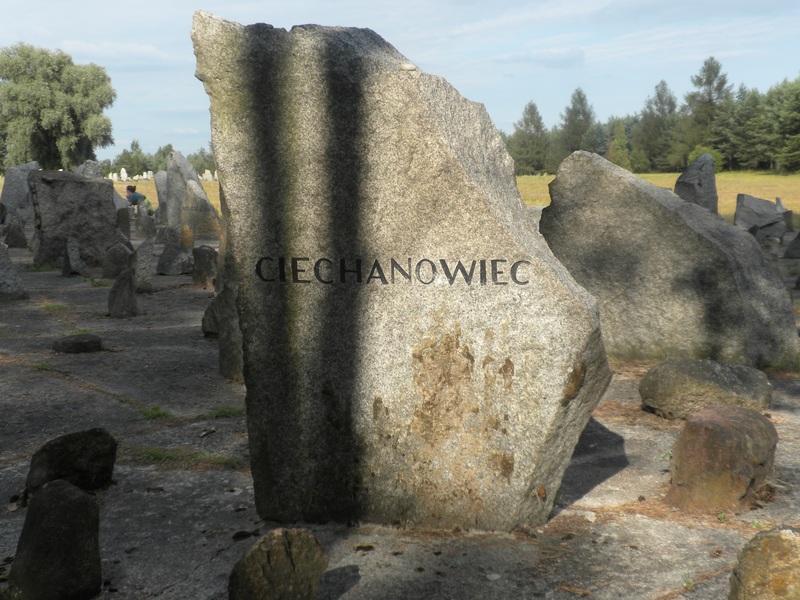 What remains are three symbolic mass graves with jagged stones marked with cities throughout Poland from which Jews were deported and murdered. 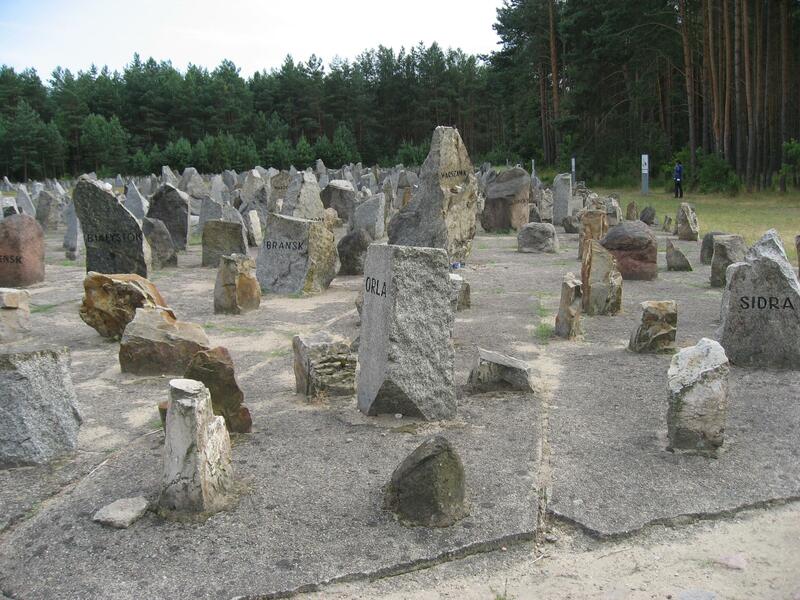 These stones are especially significant because in many instances entire Jewish populations from these cities and towns were murdered at Treblinka. The raw evil and destruction of the Holocaust is made apparent when visiting Treblinka. These sobering and overwhelming experiences marked a major turning point in our trip. Our group took time to reflect on the enormity of life extinguished in a short period of time. From the memorial site at Treblinka. 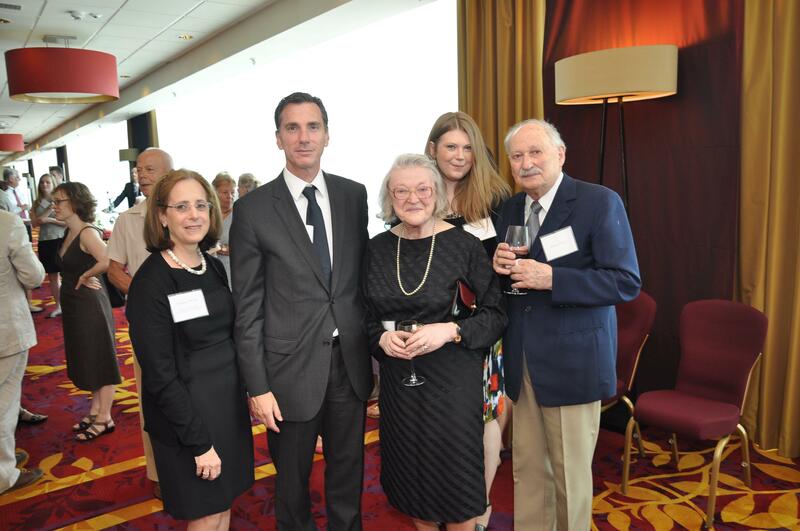 JFR Executive Vice President Stanlee Stahl, US Ambassador Lee Feinstein, JFR Senior Program Associate Agnieszka Perzan, rescuer Lucyna Bauer and her husband. Our Sunday afternoon in Warsaw was dedicated to the righteous rescuers in Warsaw. The JFR hosted almost 44 rescuers and their guests, as well as Rabbi Michael Schudwich, chief Rabbi of Poland, U.S. Ambassador Lee Feinstein, and Israeli Ambassador Zvi Rav-Ner. 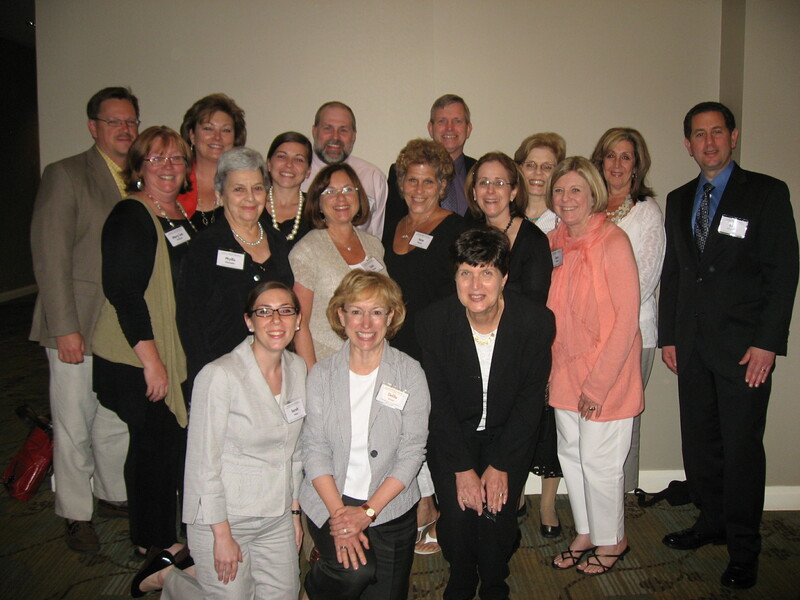 The luncheon was very successful; our teachers were able to connect with rescuers on a personal level. A few teachers have already initiated efforts to “adopt” rescuers for their classes. It is very important to bring the stories of these righteous people back to our classrooms in the United States so that their acts of incredible humility are not forgotten. Teacher Rosie Sansalone Alway with Jadwiga Sliwczynska, the wife of the rescuer Mr. Jerzy Sliwczynski, the former President of the Polish Society of the Righteous. 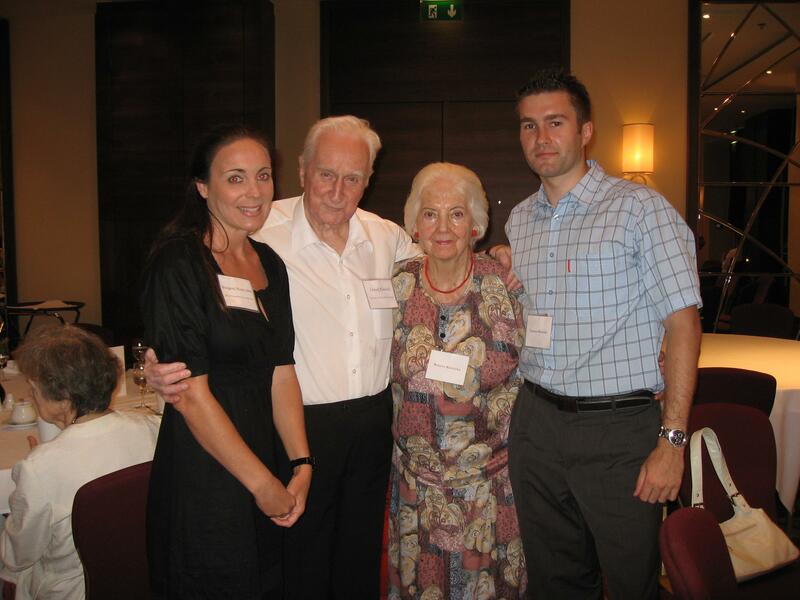 Teacher Nikki Allen with rescuer Leszek Klewicki, wife Bozena Klewicka, and grandson Tomasz Klewicki. From the Warsaw ghetto uprising memorial; this side shows strength and perseverance. Most of Warsaw was destroyed during World War II, so the Holocaust sites we visited in Warsaw are remnants or memorials. Our group visited the site of the former Warsaw ghetto, where the Museum of the History of Polish Jews is currently being built. 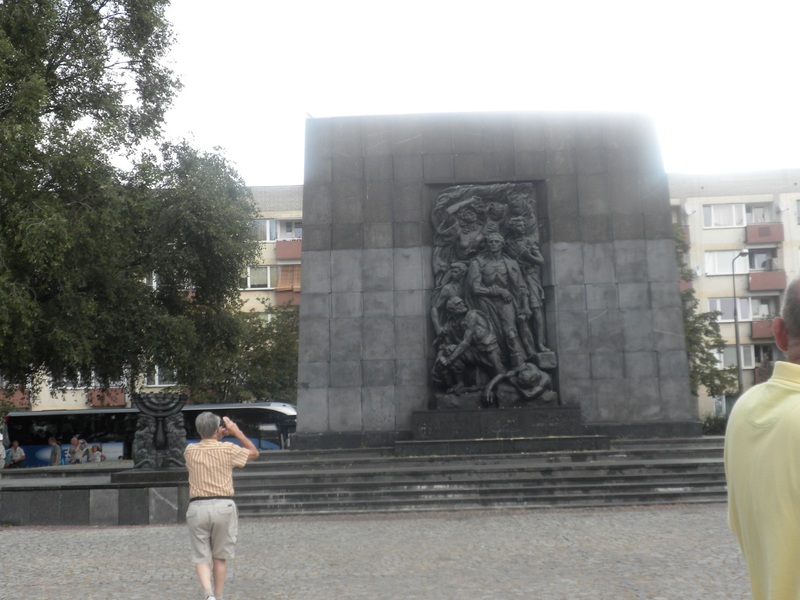 While there is little to see of the former ghetto, our group was able to discuss the Warsaw ghetto uprising memorial by Natan Rappaport, which stands across from the museum site and has two very different faces. The first side we viewed, which most people consider the back of the memorial, conveys a message of despair, and represents the destruction of the Jews and, perhaps, the crushed uprising. The other side of the memorial, however, emanates a completely different message: that of strength and perseverance. Although they convey different messages, the two faces of this memorial remind viewers of the double narrative of the Warsaw ghetto. Amidst the despair of life in the ghetto, and the feeling of helplessness against destruction, the Warsaw ghetto Uprising has become one of the symbols of armed resistance during the Holocaust. 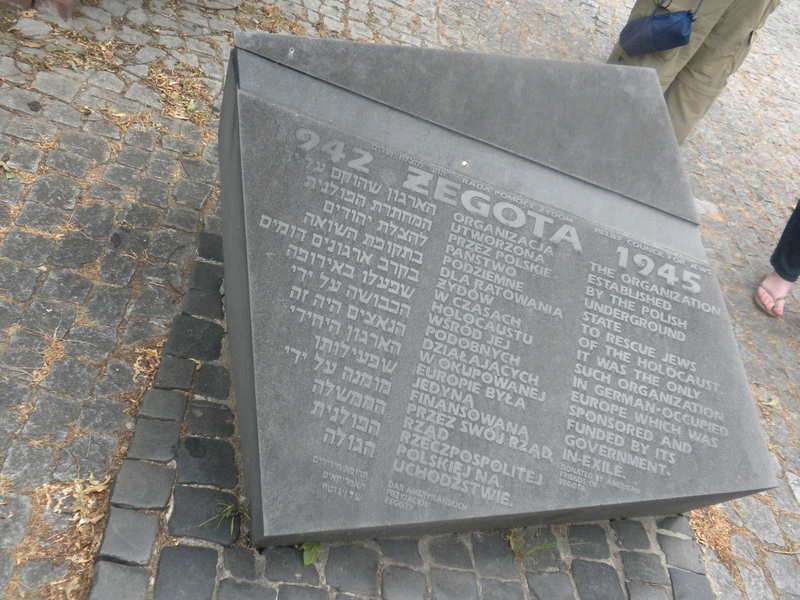 To the side of the Warsaw ghetto memorial is Zegota memorial, dedicated to that part of the Polish underground which helped Jews during the Holocaust. Beloved rescuer Irena Sendler was head of the children’s bureau of Zegota, and we remember that it was her efforts and the efforts of Zegota that helped to save Jewish men, women, and children. The memorial, dedicated in 1946, is “for those who died for dignity of the Jewish nation and for the Polish nation.” A few days prior to our arrival in Warsaw, Irena Sendler’s grave had been desecrated with antisemitic graffiti. By the time we visited her grave, at the end of our time in Warsaw, the graffiti had been cleared and sanctity was restored. We were also able to visit the Jewish cemetery in Warsaw, which is a very important site because it is one of the only remaining links to the generations of Jews who lived in the city. The cemetery, which is very densely packed, was one of the few places where the Jewish community was given land, so the cemetery traditionally served as a central place for Jewish communities throughout Poland. When walking through this cemetery and looking closely at the matzevot, there is a sense of the rich Jewish life that once was, and that will never be. We also visited Umschlagplatz, the only place in Warsaw to retain its German name, where some 350,000 Jews were deported to Treblinka. Our second day in Berlin was just as full as our first. We began our day at Bayerischer Platz, an area in Berlin where Jews were forced to move out of their homes by the Nazis. We visited this area because it has a very unique memorial to commemorate and lament the draconian laws forced upon Jewish Berliners. 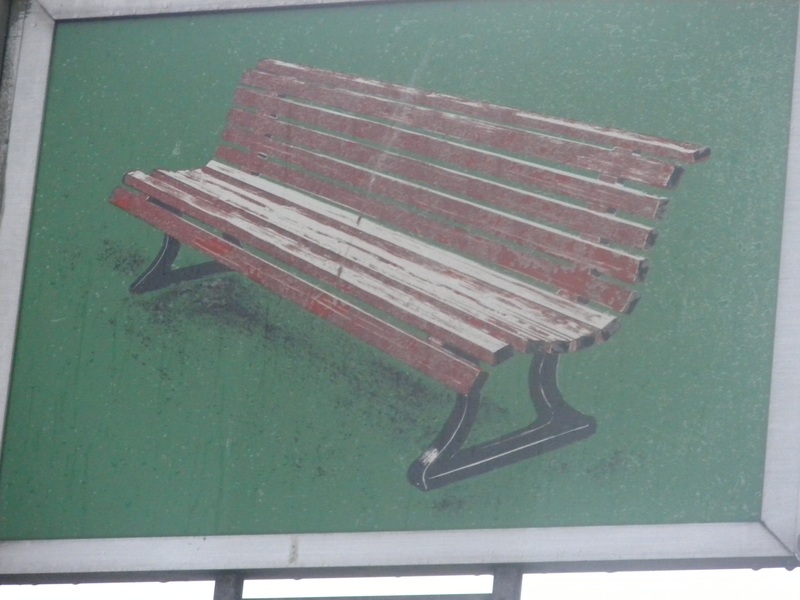 Throughout the area there are small square icon-like pictures that are meant to evoke the children’s game “Memory”, where each icon corresponds to a measure or law forced upon Jews. This poignant memorial is a constant reminder of the restricted life of Jews in Nazi Germany, and each icon represents freedoms taken away from Jews. We were fortunate enough to be able to purchase the books that explain all of the icons, and our teachers are hoping to develop a classroom activity using these signs. 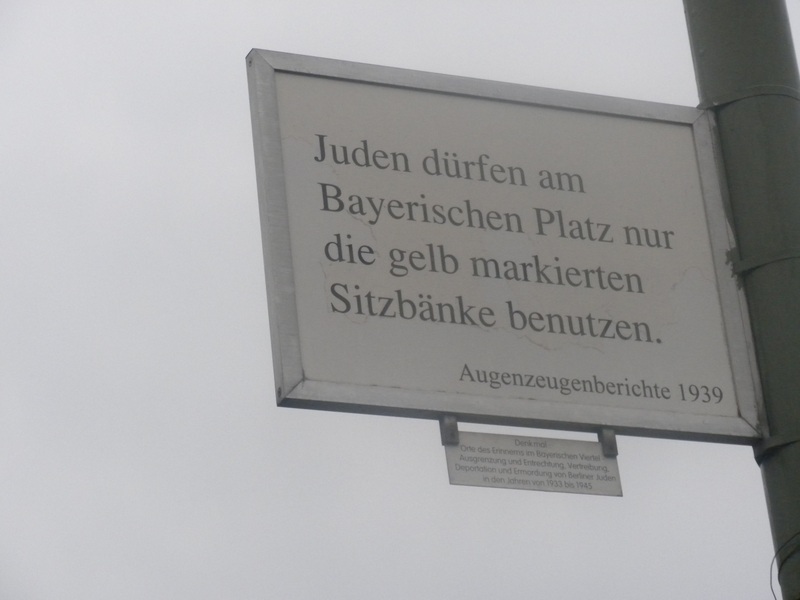 The corresponding law on the back of the icon; the law stated that "At Bayerischer Platz, Jews may sit only on yellow marked park benches." We left for Brandenburg Gate, the iconic symbol of Berlin where Robert Jan van Pelt gave a brilliant lecture about the gate’s place in German history. Throughout time the gate has taken on many different meanings. Professor van Pelt peeled back the layers of history of the gate for us, and we were able to see how closely the tangible gate is intertwined with the intangible idea of the German Spirit. 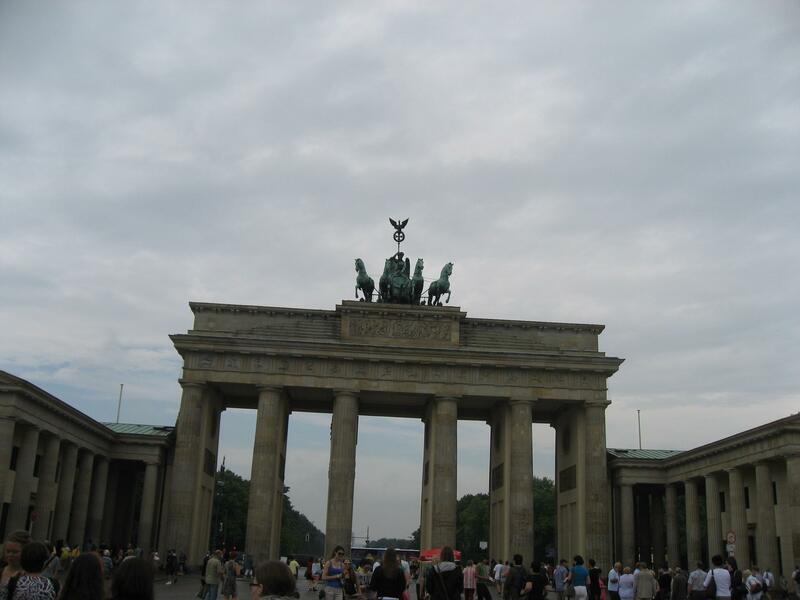 Brandenburg Gate was even a symbol of German Nationalism before Germany became a unified state. The Nazis also perceived the gate as a symbol of German Nationalism, and when they won the January 30, 1933 election they marched through Brandenburg Gate as a way to reinforce the Nazi party as the backbone of German strength and power. We then had some free time to look at the gate and reflect on Professor van Pelt’s lecture, which illuminated for our group so many facets of modern German history. Following this we went to the Jewish Museum in Berlin, a museum that chronicles the history of German Jews from their arrival in Germany in the late 9th century through the modern age. The museum’s architecture, designed by Daniel Libeskind, seeks to tell the story of the German Jewish experience. Our group then departed Germany on a train to Poland, where the second leg of our trip would commence. 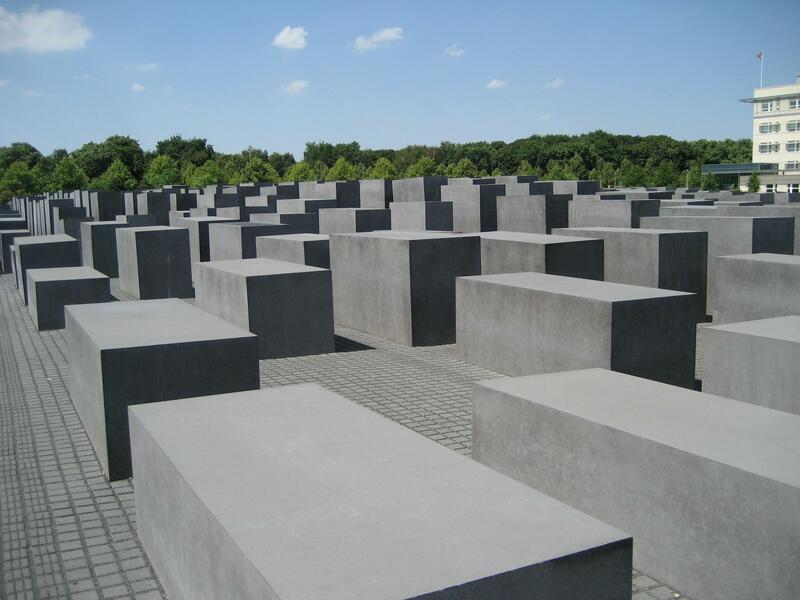 The Denkmal, or the "Memorial to the Murdered Jews of Europe" in Berlin. Following our visit to the Wannsee House we went to the Denkmal (which means monument in German) or the “Memorial to the Murdered Jews of Europe.” The memorial, which is less than ten years old, is controversial because it is a very abstract outdoor monument, completely open to the public with no explanation as to how one should interpret the memorial. The memorial is demarcated by a square area, which consists of concrete stones. The stones start off small and get progressively larger as one goes deeper into the monument. The ground inside the monument is uneven, and the feeling you get walking through is that of uneasiness and confusion. One popular interpretation of the Denkmal is that walking through the monument symbolizes the European Jewish experience: uncertain and unstable. Below the Denkmal is an underground museum dedicated to educating about the murder of Jews in Europe. We met with the Head of Education at the museum who talked to us about the history of the Denkmal from its inception to the addition of the underground museum, which was built to work in conjunction with the Denkmal and was added as a compromise in order to give an explanation of the site. Our group was given time to walk through the museum, where we viewed the museum’s very stirring exhibitions. One particularly poignant exhibit highlighted letters written from Holocaust victims to relatives and friends; we learned that many of the authors of these telling documents were later murdered. The "Neue Synagoge" in Berlin. 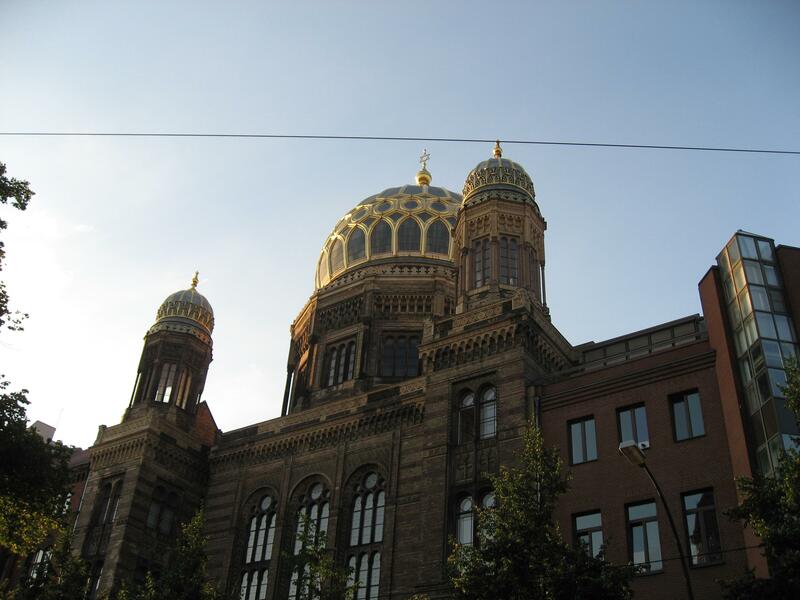 After leaving the museum we were able to walk through different parts of Berlin, and were able to see the famous Oranienburger Strasse Synagogue or the Neue Synagoge, recognizable by its golden dome. It is a gorgeous synagogue, and it is a miracle that the synagogue survived the war. 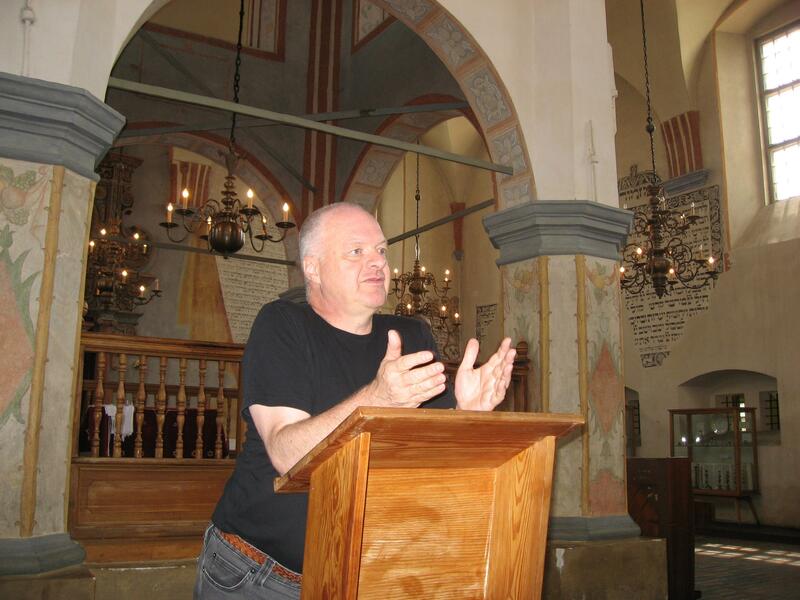 We learned from Robert Jan van Pelt that the dome of this synagogue never burned. The famous picture taken of the synagogue during kristallnacht (the November Pogrom), where the synagogue dome appears to be burning, is actually an illusion; it was the building directly behind the synagogue that was aflame. The survival of this synagogue is attributed to a police officer, who refused to let the synagogue be destroyed on kristallnacht. We concluded our eventful day by having dinner with rescuer Frieda Adam. We were able to ask her questions and, with the help of Robert Jan van Pelt’s translating, express our awe of her. 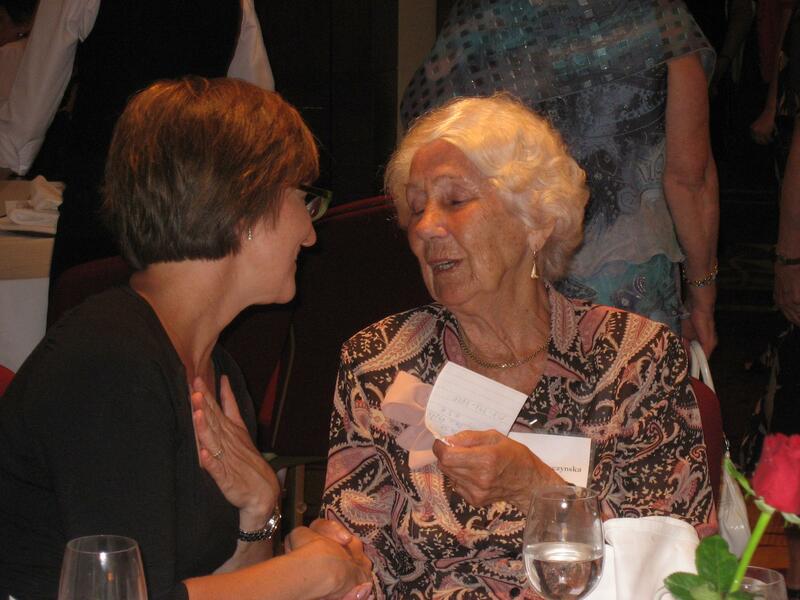 Our group was honored to be in her presence; at 92 she remains a model of courage and humility for all. Frieda has been supported by the JFR for almost 19 years and throughout the evening she thanked us for the help. Frieda continues to live in the same apartment building where she hid a Jewish brother and sister for three years. The JFR Education staff (Kristen Lefebvre, Stanlee Stahl and Larissa Shulman) with rescuer Frieda Adam. We were also accompanied by Professor Atina Grossmann who lectures at the JFR’s Summer Institute for Teachers and Dr. Kathrin Meyer, Executive Secretary of the International Task Force for Holocaust Education, Remembrance, and Research. 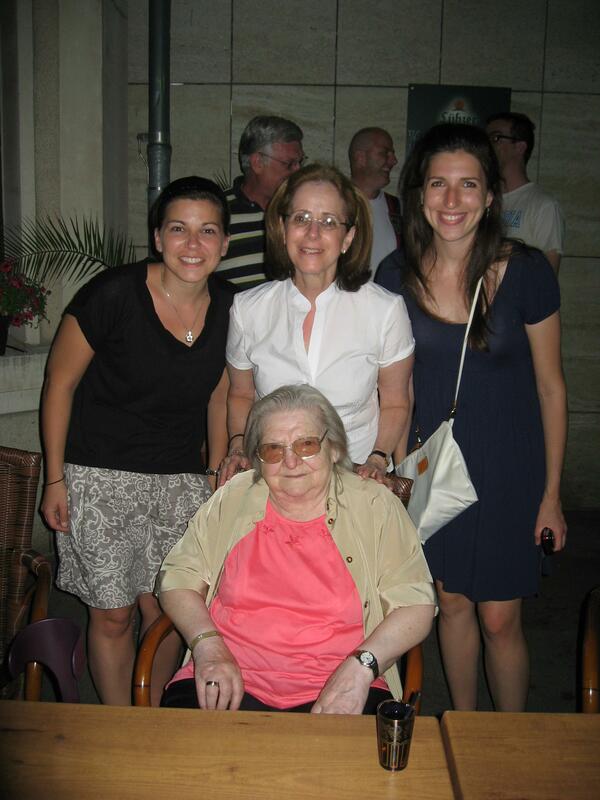 Both Professor Grossmann and Dr. Meyer were in Berlin and were able to join us for dinner and to meet our teachers. We traveled from Buchenwald to Berlin Thursday night, enabling us to have the entire next day in and around this historic city. We began our day at the Grunewald Rampe, which is the railroad station in Berlin from which Jewish Berliners were deported. The selection of this station by the Germans is significant. The Grunewald Station is in a beautiful, upper-class section of Berlin, an area where many Jews once called home. The station now contains two memorials commemorating the deportation of Jews from the capital. The second memorial at Grunewald Station, constructed by the German Railroad Company. 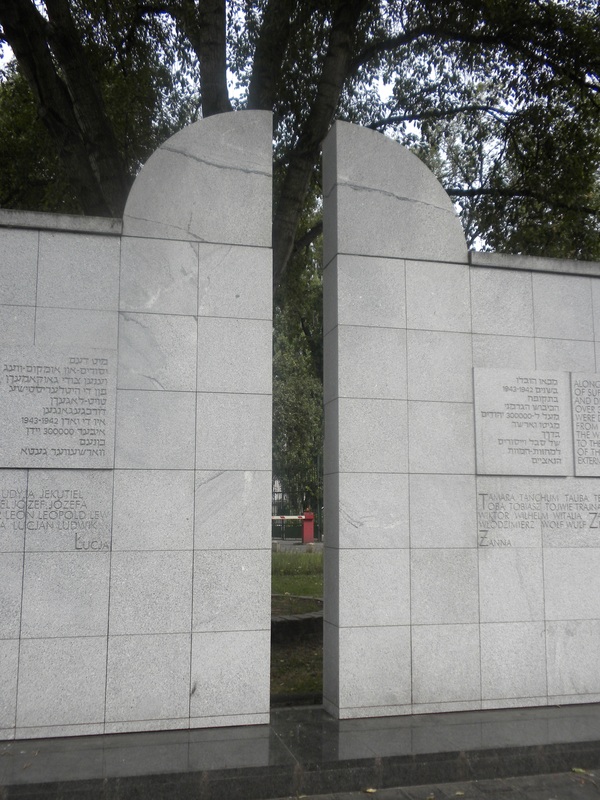 The first memorial is located near the entrance of the station and commemorates the Jews from Berlin who were deported. 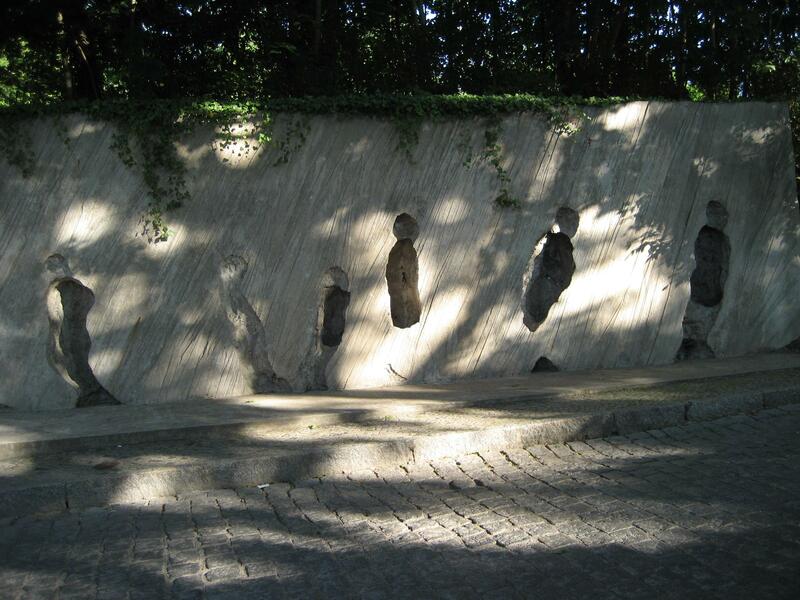 The memorial contains sunken-relief silhouettes of figures, which are perhaps meant to depict the disappearance and absence of these people as a result of the transports. While this memorial is moving, our group found the second memorial to be even more meaningful. 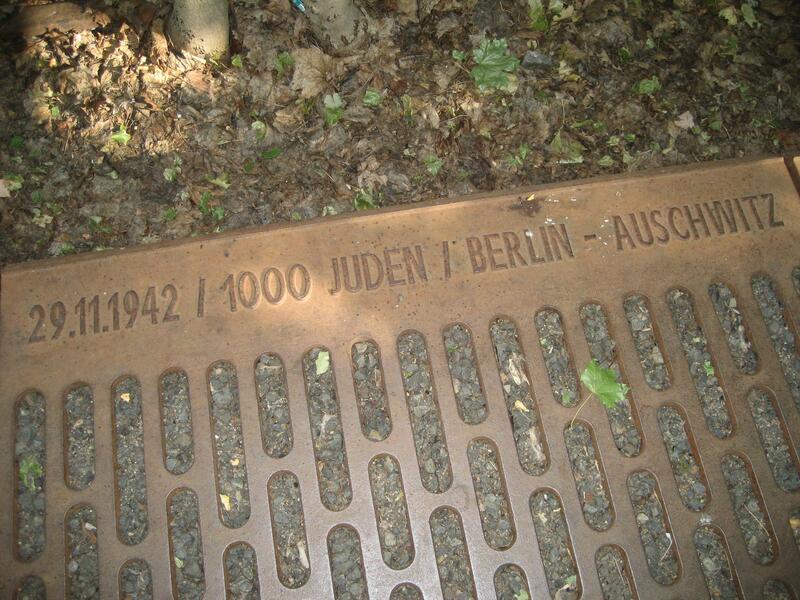 This is because the second memorial, which was constructed by the German Railroad company, is dedicated to the “Jewish citizens of Berlin.” This phrasing is interesting because these deported Jews are now regarded as former citizens of Berlin. At the time, however, they were not considered citizens. 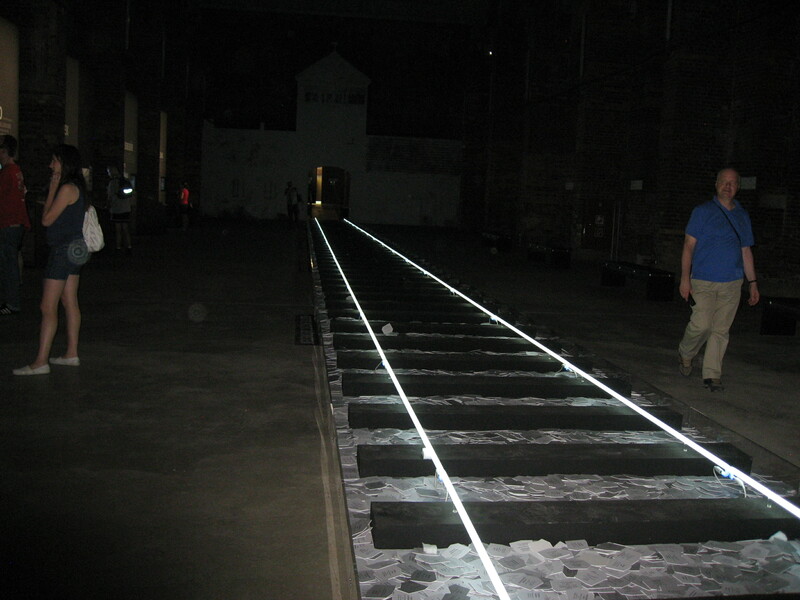 The memorial consists of small plaques which line the tracks that give the date, the number of deportees and the destination of each transport that left the station. These plaques represent a disturbing chronology of the Holocaust as you see the frequency of the transports and the number of deportees increase over time, and then decrease as Berlin became virtually void of Jews. The fact that the German Railroad Company played such an integral role in the deportation and subsequent murder of so many Jews adds another layer to this memorial, where it can be seen as a form of reparation on the company’s behalf. We left Grunewald Station for the House of the Wannsee Conference, which is a museum that educates about the Wannsee Conference, the events leading up to it, and its consequences. The Wannsee Conference, which took place on January 20, 1942 and was attended by a small group of high-ranking Nazi officials, was the meeting at which the “Final Solution” was officially organized. During the conference, Nazi officials and agencies determined the logistics and responsibilities for implementing the so-called “Final Solution” of the Jewish “problem,” establishing the SS as the highest German authority on the problem. Wolf Kaiser, Deputy-Director of the Wannsee House, gave us an in-depth tour of the exhibition, explaining both the history of the house as well as the history of the Wannsee Conference and its significance within the history of the Holocaust. What was chilling for our group to learn was how the “Final Solution” was conceptualized over time. The Wannsee Conference was not a single event where the “Final Solution” was first conceptualized, but rather, it was the sum of ideas about murdering the Jews in mass numbers. At the Wannsee House, learning from Wolf Kaiser (center). 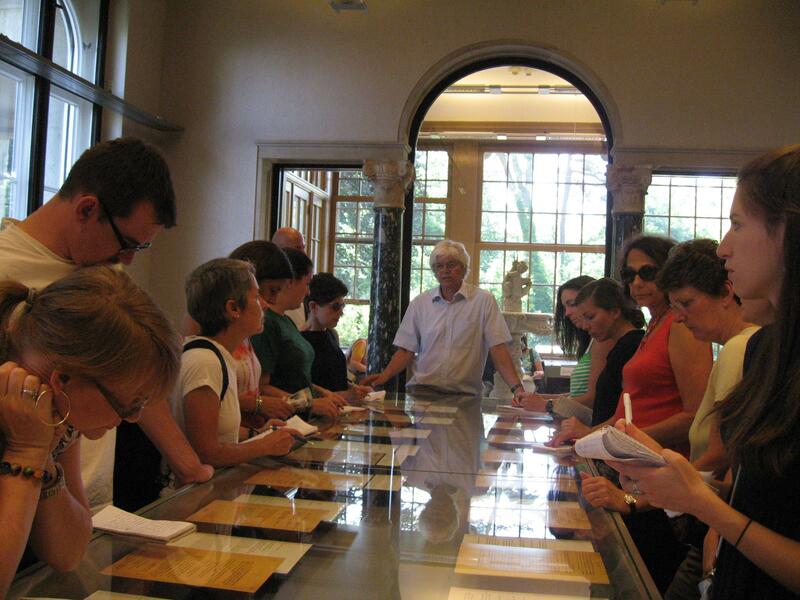 In the glass case is the only remaining copy of the notes from the Wannsee Conference, tangible proof that the conference took place. After learning about the difficult history of the “Final Solution”, Wolf let us walk around the museum on our own and then took us to the education center to discuss how the Holocaust is taught in Germany. It was interesting to hear Wolf, who is an important international figure in Holocaust education, talk about some of the obstacles and issues he faces when educating teachers and their students in both Germany and Europe. Usually these issues have to do with time constraints because teachers can spend only a limited time teaching the subject and are therefore not able to cover the subject in-depth with students. After our morning visit to Weimar, we spent the afternoon in Buchenwald, which is a mere fifteen minutes outside of Weimar but feels like a separate world. We learned that the area was once a popular hiking destination for Weimarians, and that Goethe has a special tree on the premises where he wrote one of his most well-known pieces of literature. Knowing this history made the contrast of Buchenwald and Weimar more shocking. The vast expanse of Buchenwald contains little of the original camp, but the main camp area has been left as an empty field with a few remaining buildings as a way to memorialize what was once there. We learned first about the administration of the camp, initially headed by the commandant Karl Koch. Koch was notorious for making conditions for inmates especially humiliating and treacherous. Koch would force Jewish prisoners to perform Jewish songs and dances, and he instituted a camp band made up of inmates. There was also a zoo, where the animals were well fed, in full view of the inmates and directly across from the camp crematoria. These obscene forms of mockery show how Koch’s administration took vestiges of enjoyment from Jewish prisoners’ former lives and used them as a form of torture. We learned, additionally, that Koch’s wife, Ilsa, was equally evil and would hand-pick good-looking prisoners from transports to work in her private residence. Koch also instituted a store at Buchenwald, which further demonstrates how ordinary life was completely distorted for prisoners in the camp. Koch set up a system where inmates could “earn” money and purchase goods that were brought into the camp cheaply but were sold for double what they cost. This store was the brainchild of Himmler, who was surprised after visiting Buchenwald that there was no incentive for prisoners to work hard. It is also worth noting that homosexuals were barred from using the Buchenwald store. After learning about these different facets of the camp, it is evident how Buchenwald became a contorted version of reality. The camp became its own municipality and although it was modeled on aspects of ordinary life, it served as a horrific alternate universe. Knowing this allows for a better understanding of Nazi mentality and provides insight into how guards were able to justify their actions inside the camp. 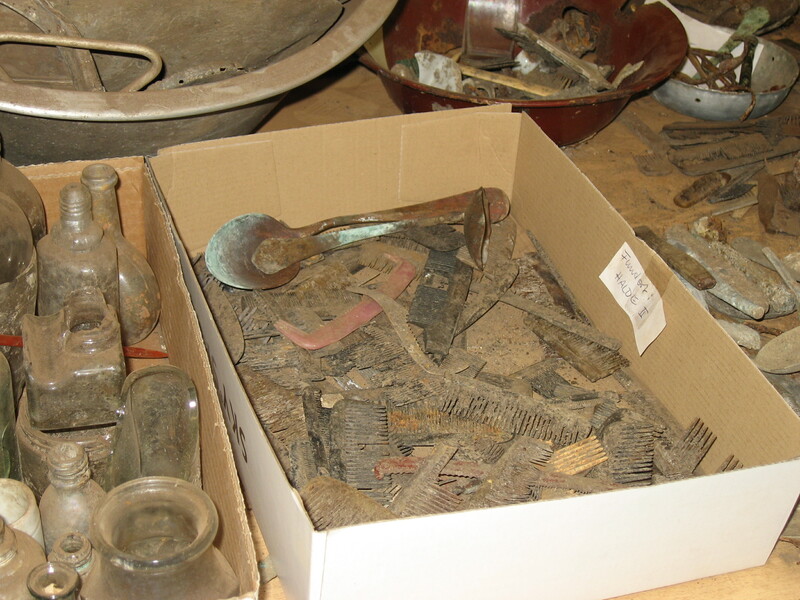 Buchenwald has an extensive artifact and restoration center, which we were able to visit because of our contacts. We saw a number of different personal possessions including combs, bowls, brushes, and toys. It was very moving to view these objects, which seem to speak volumes on their own about life in the camp. Inscribed on the gates of Buchenwald are the words “JEDEM DAS SEINE.” This is literally translated as “To each his own,” but it can also mean “Everyone gets what he deserves.” After American forces liberated the camp on April 11, 1945 Buchenwald was converted into a Soviet prisoner camp where former Nazis were inmates. These words were then turned around and interpreted to mean that the Nazis were getting what they deserved as prisoners of the Soviets. We left Buchenwald by walking to the memorial for the camp constructed by the GDR. This led to a discussion with Robert Jan van Pelt about the role of memorials in providing a proper entrance and conclusion to a memorial site. 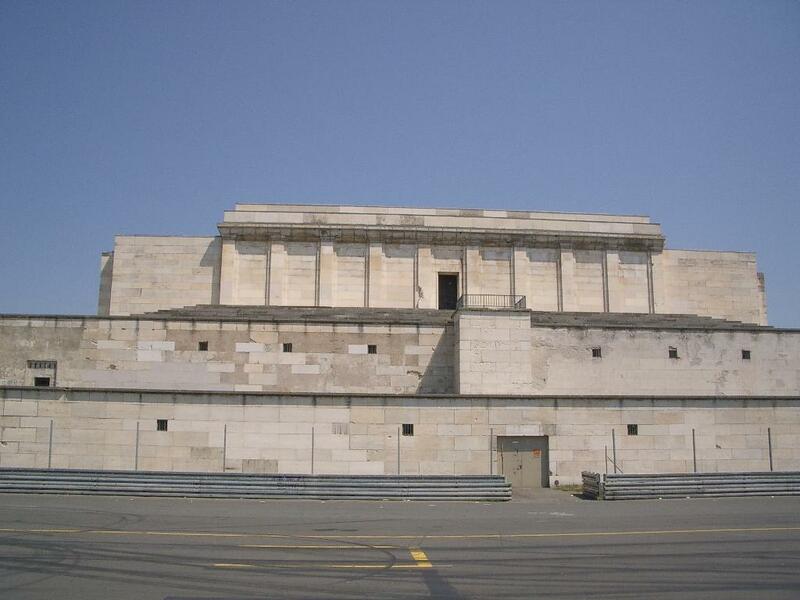 The memorial begins as a descent, where seven large steles with engraved depictions of pain and suffering represent the seven years that the National Socialists operated the camp. The themes on the stones then change to those of perseverance and triumph, and continue until the very bottom of the descent. The memorial continues with large stones with the names of the home countries of those individuals who were murdered in the camp. 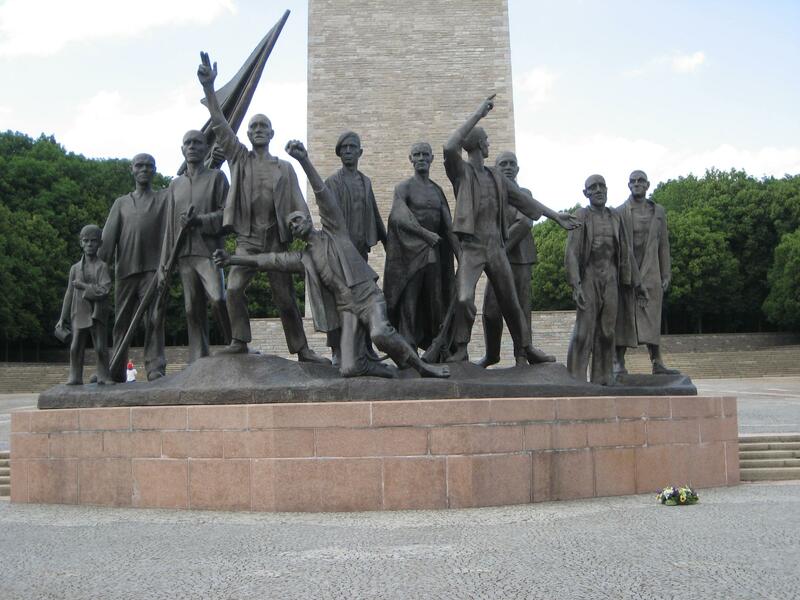 Sculpture of Soviet workers from the monument at Buchenwald, which was constructed by the GDR. On the ascent back up, and the climax of the memorial, one initially sees the tower of freedom. During the climb, however, a sculpture of a group of Soviet workers comes into view, giving the feeling of exuberant victory. The Soviets, however, did not liberate Buchenwald; American troops did. Experiencing the walk through this memorial and listening to Professor van Pelt’s insights and interpretation helped us to see the memorial through a different lens. Though it was not Soviet prisoners of war nor Soviet troops who liberated Buchenwald, that is the message the memorial portrays. Instead of representing events as they occurred, this monument seems to rewrite history. As we walked back to our bus to proceed to our next destination, we had plenty of food for thought. We spent the morning walking through the city of Weimar, the long-time cultural center of Germany. The 1,111-year-old city is beautiful and has a fascinating history. 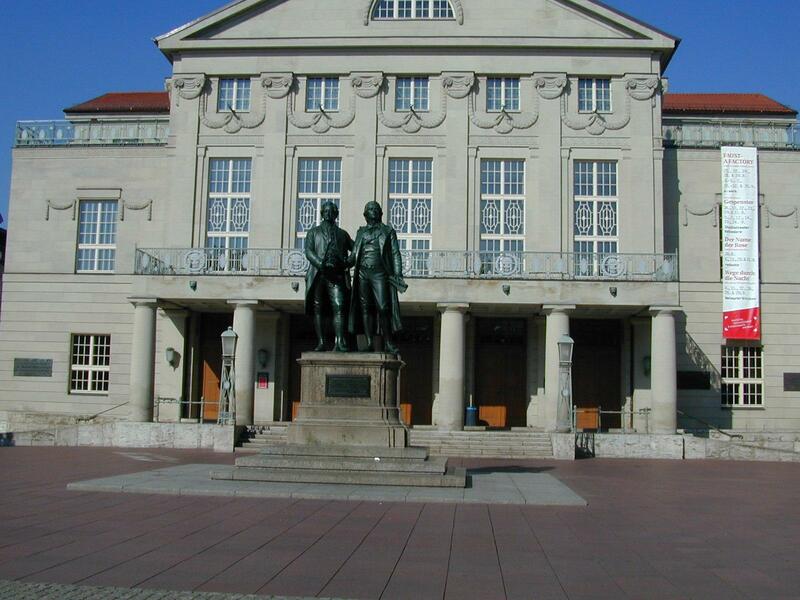 Not only was the city home to German cultural figures Goethe and Schiller, but it was also the place of origin for Bauhaus architecture and style. Our guide, Alexander, took us through the city, showing the homes of Goethe and Schiller and recounting interesting aspects of their public and personal lives while in Weimar. Our group also saw the first Bauhaus building constructed, which Weimarians criticized as looking like a public toilet! After walking through the charming Goethe Park, Alexander took us to the famous Hotel Elephant, where Napoleon once stayed and politicians now stay. We also learned that this was Hitler’s hotel of choice when he stayed in Weimar, and we were reminded that when he came to power Hitler was very popular in Weimar. Alexander also discussed the history of the Weimar Republic. After World War I Weimar became an attractive prospect as the capital city of Germany because it seemed safe and far removed from the roiled political parties in Berlin, Munich, and other larger German cities. The Weimar Republic, as it was known, officially began on August 11, 1919 and lasted until 1933. The Weimar Republic was stigmatized because during its time Germany endured horrible economic downturn and social angst. Many Jewish citizens were active in the Weimar government; this, in part, laid the foundation for the antisemitism that spread during the 1920s. Being in this beautiful city and knowing about the unrest in the days of the Weimar Republic is difficult, and it is sometimes hard to believe that this quaint city was once the symbol of a devastated Germany. We continued on to Nuremberg, which is a critical place to visit in order to understand The Third Reich and the Nazis’ rise to power. 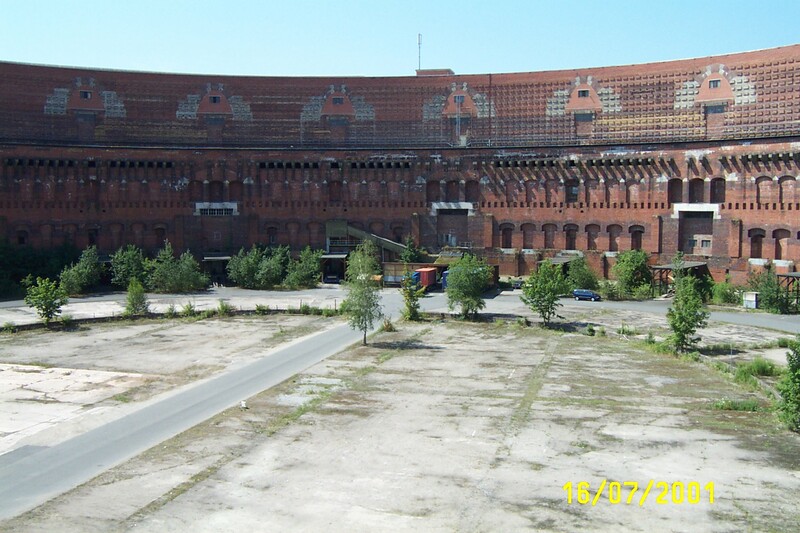 Nuremberg is known not only for its infamous anti-Semitic laws, the Nuremberg Laws, but also for the Zeppelin field, where Hitler held massive party rallies. Nuremberg is also known for the 1946 Nuremberg trials, where the city once viewed as a symbol Nazi power became a symbol of the downfall of Nazism. Our first stop in Nuremberg was at the Documentation Center at the Nazi Party Rally Grounds, formerly the Congress Hall of the Nazi Party Rallies, which is now a museum that educates about Nazism and the Holocaust. We attended a presentation that helped us review and learn more about the Nuremberg trials. The presentation reviewed which Nazis were tried, their indictments, which judges and lawyers presided over the trial, and the verdict. After attending this fascinating presentation, we had the opportunity to walk through the temporary exhibition on railroads and the Holocaust. We learned about how the train tickets were often paid for by the Jews who themselves were being deported. It was also made clear that many working for the railroad companies knew about the atrocities being committed against the Jews, but refused to acknowledge this in the aftermath of the Holocaust. Part of this exhibit includes a camera that shows live feed from the concentration camp sites. We later saw this video camera on our visit to Treblinka. Also on view at the Documentation Center is the permanent exhibition which contains the original copies of the Nuremberg Laws. It was chilling to see these documents that had the power to make life unbearable for Jews in Germany. We then stepped outside and headed over to the Zeppelin Field, where Professor van Pelt gave an amazing lecture on how Nazism morphed from being a political party into a fervent religious ideology in Germany. This change occurred after the “Night of the Long Knives” (June 30 – July 2, 1934) when the Sturmabteilung (SA), known as the Brown Shirts, were eliminated from the Nazi Party. The SA had been the symbol of the Nazi party on a local level, and their removal caused Germans to seek a new embodiment of the party, which they found solely in Hitler. The fact that Nazism was an ideology so closely intertwined with the idea of a “pure” German spirit allowed Hitler to also become the embodiment of Germany itself. In this way, Nazism in Germany went a step beyond being an extremist and fanatical political party; it became a religious ideology embodied by a single man and followed wholly by a nation. Following our day in Munich we traveled to Dachau where we were met by Waltraud Burger, Head of the Education Department, and Nicole Schneider who was to be our guide. Very few structures exist from the original camp. Instead replicas of the buildings in the camp have been constructed, although many of the structures that once existed in Dachau have not been rebuilt. The memorial site exists as an educational tool, as a means for helping people to understand the horrors endured at the camp. The camp memorial site is kept immaculately clean like a park, which is ironic given that when the camp was operational prisoners were demanded to keep the camp sterile, despite filthy conditions and the lack of means to do so. 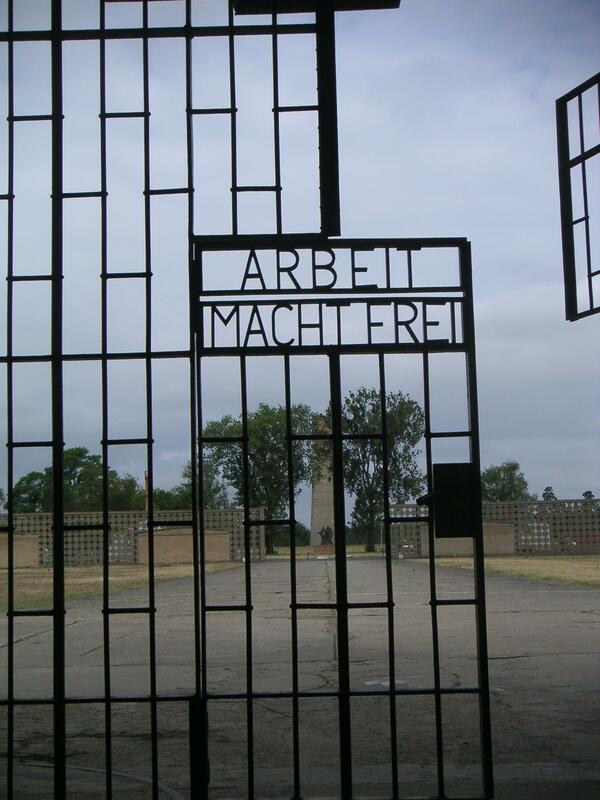 The gate at Dachau, with the inscription "Arbeit Macht Frei" or "work sets you free." Nicole took us through the reconstructed gate which has the inscription “Arbeit Macht Frei”, or “work sets you free.” We also walked through the recreated barracks, gas chambers and crematoria, while Nicole explained the terrors faced by inmates. Given that this is the first Camp we visited as a group, this was a moving experience for all. Additionally we learned about the history of Dachau from its inception to its liberation. The camp was liberated by Americans, an event well-documented by photographer Lee Miller. Just before walking through the gate of the camp, we stopped at the plaques of the 42nd Rainbow Division, the 45th Thunderbird Division and the 20th Armored Division of the U.S. Seventh Army that liberated the camp. We owe a great deal of respect and honor for these Americans who risked or lost their lives to liberate camp inmates. 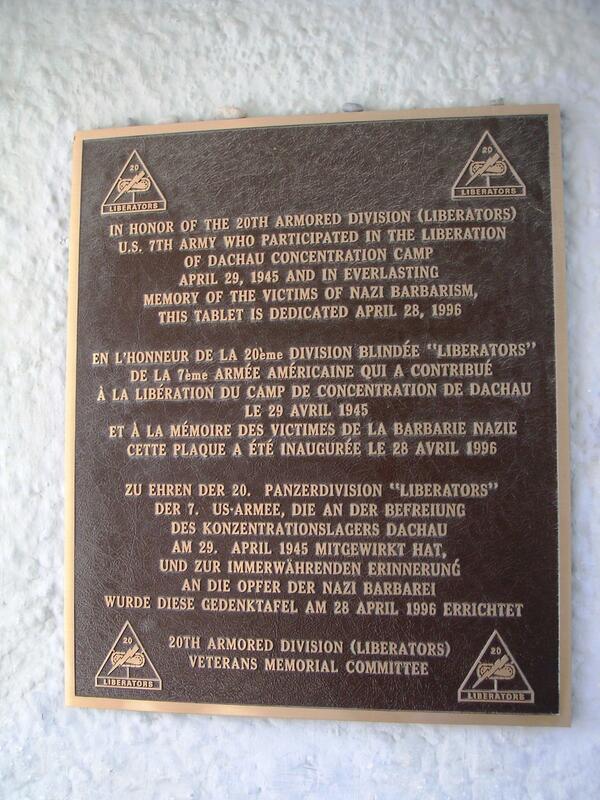 Plaque in honor of the 20th Armored Division of the U.S. 7th Army. One of the major issues, according to our guide, about having the reconstructed site of Dachau is that visiting the site changes your perception of the camp. The camp is not as it was, but when you visit it with its building replicas, you begin to think that this is what the camp was like. In reality we cannot even begin to imagine what life was like for the inmates of Dachau, nor can we imagine what it really looked like. This is countered by the fact that the memorial site is a constant reminder of the atrocities of Dachau, and its presence helps people remember history. Groups of German school children visit the memorial in order to learn about the Holocaust, although according to our guide, this is often in lieu of classroom Holocaust education. Our study program began in Munich, which is an apt place to start given that Nazism has its roots in the city. We started off with a lecture in a park, where Professor Robert Jan van Pelt set the historic tone by explaining the excessive inflation in Germany’s post-World War I economy. He also gave us each a one billion Reichsmark, which we learned could not even buy an egg in interwar Germany! We then visited German World War I memorials where Professor van Pelt explained to us how anti-Semitism rose during the interwar time. This occurred for a number of reasons, namely, Germans felt that Jews had shirked military duty in World War I. There was also the false idea that it was Jews who had been responsible for the humiliating war reparations and stipulations inflicted on Germany after World War I. Jews, it seemed, had “stabbed Germany in the back.” These myths, taken with the distraught interwar economy, set Jews up as a target in Germany, and laid the foundation for Jews being viewed as outsiders in German society. Robert Jan van Pelt giving his lecture about money and inflation in interwar Germany. Following this we visited and learned about sites and monuments especially important to the rise of Nazism. These included the Feldherrnhalle, where the November 9, 1923 attempted Nazi takeover (the Putsch) was halted in a bloody clash with the police, initiating the idea of Nazi martyrdom which was later used to indoctrinate Germans. We also visited Koeningsplatz, site of the still-existing building of the former Nazi headquarters. Our sunny tour of this modern and beautiful city was inexorably shadowed by Munich’s tainted history, and it is difficult to see the city afresh without also remembering that it harbored one of the most monstrous regimes known to humanity. In addition to visiting sites from the former National Socialist government our group also visited the site of the old synagogue of Munich, which we were saddened to learn is now an upscale department store. 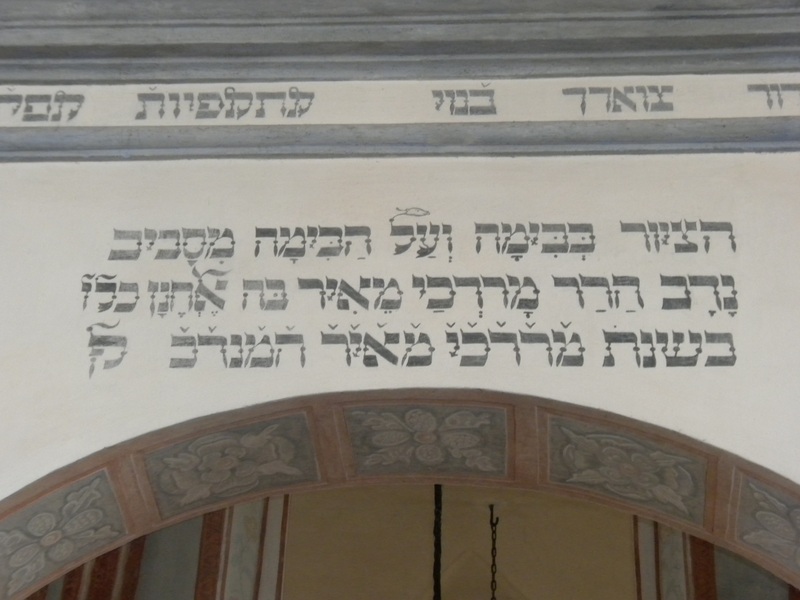 We found a glimmer of hope, however, when we traveled to Munich’s new synagogue. A sparkling building modeled after a tabernacle in the desert, the building seems truly fitting as a Jewish oasis. 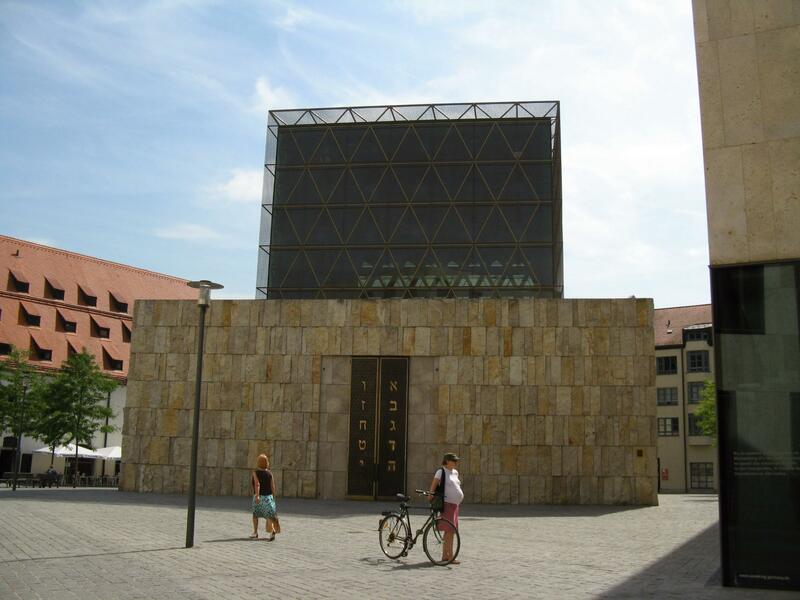 The new synagogue in Munich, modeled after a tabernacle in the desert. What a fantastic summer it has been! 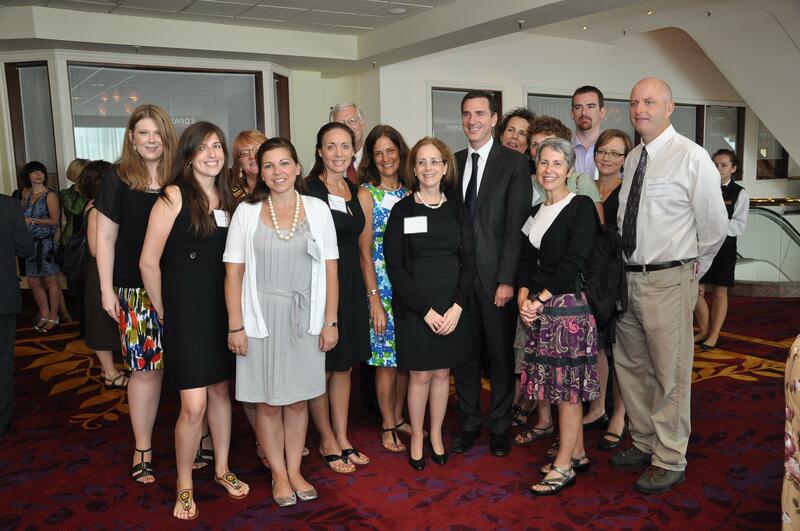 We began it with our annual Summer Institute for Teachers, where we welcomed 37 new Alfred Lerner Fellows into The JFR family. 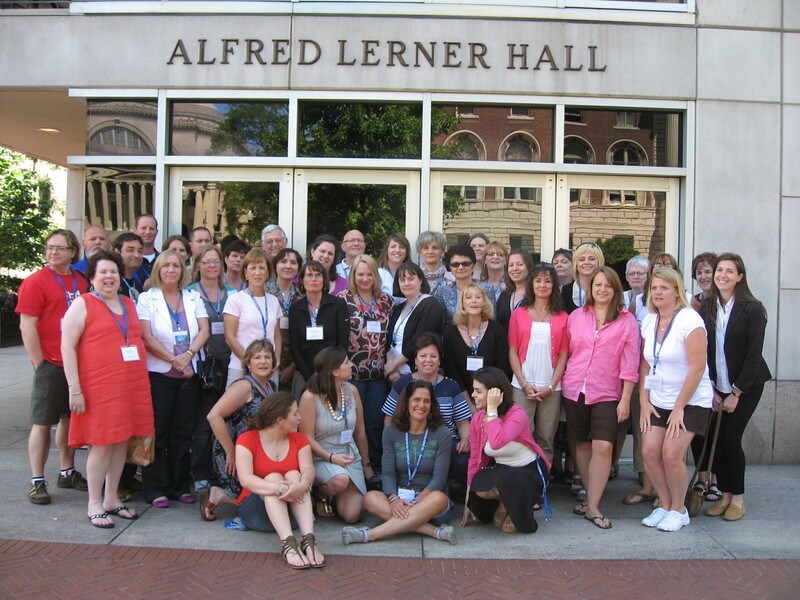 After five days of hearing world-class scholars and participating in intensive learning our Lerner Fellows left Columbia with new perspectives on how to teach the Holocaust to their students. 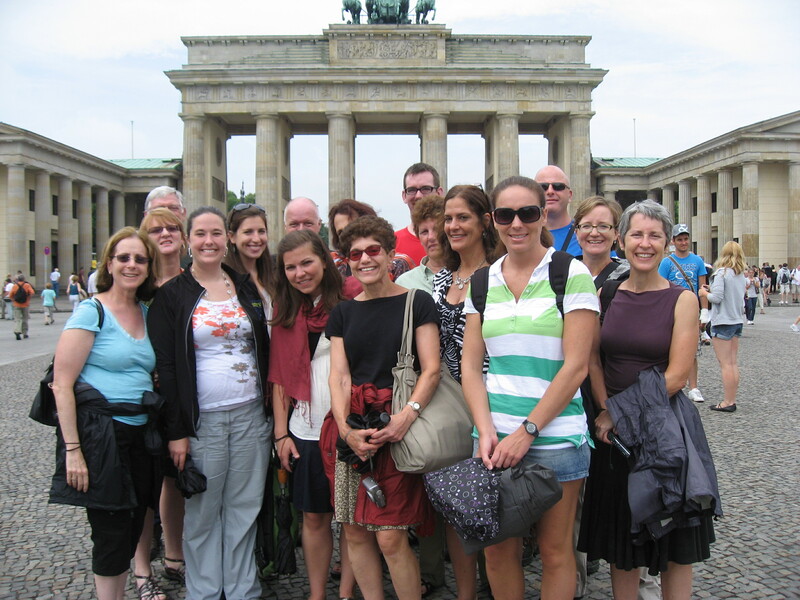 Days later we left for Europe for our European Study Program in Germany and Poland with 16 participants. We had a sobering and insightful two weeks traveling to Munich, Nuremberg, Weimar, Berlin then Warsaw, Krakow and Oswiecim. 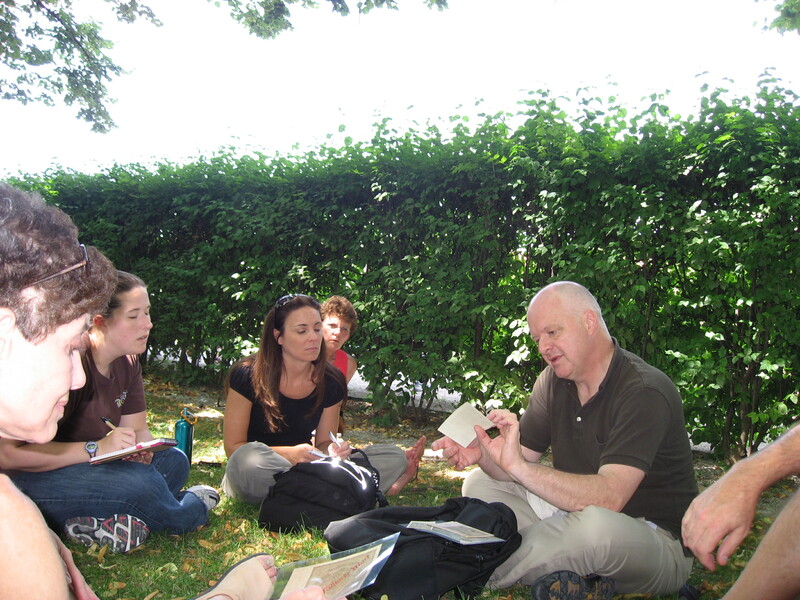 Through the program itinerary and Professor Robert Jan van Pelt’s invaluable synthesis and knowledge, our group was able to unfold history and gain a deeper understanding of the rise of Nazism and the tragedy of the Holocaust. Although we had hoped to blog about these unforgettable two weeks while in Europe, we were not able to because of difficulties with internet access. Over the next several days, however, we intend to post about some of the highlights from this very meaningful journey. Please check back. Tomorrow we’ll hear from Dr. Peter Hayes of Northwestern University and Reverend John Pawlikowski of the Catholic Theological Seminary. Having the opportunity to meet with like-minded individuals who are dedicated to the study of Holocaust history and the importance of Holocaust education is always an inspiring and energizing experience! This Memorial Day let us take time from our family gatherings, trips to the beach, and community activities to reflect on the sacrifices made over the generations by the men and women who so nobly served in our armed forces and to those who gave their lives for our country. Today, May 31, 2010, I remember my uncle, the man for whom I am named, Stanley Goldblum. My uncle Stanley served in the U.S. Army and was killed on May 28, 1944 in the battle of Rome. He is buried at the Sicily-Rome American Cemetery located in the town of Nettuno, Italy, which is immediately east of Anzio – a major beachhead for the Italian campaign, and south of Rome. He was from Queens, New York City – he loved his country, believed that we had to stop the Germans, he loved his family (I have been reading his letters to my mom), and he loved life. The sacrifices of our servicemen and women can never be fully understood by those of us who have never served – we owe them our respect and gratitude. May this Memorial Day find the members of our armed forces both here at home and around the world safe. On Wednesday, May 26th, New York City teacher Erika Plumey and 15 of her students from Validus Preparatory Academy visited with Hungarian rescuer Guido de Gorgey. The visit, which the JFR helped to organize, was part of the students’ three-day Holocaust history expeditionary learning project. Erika, who has attended several of the JFR’s Holocaust education programs for New York City teachers (click here to learn more about our programs), wanted to provide her students with an intensive, out-of-school Holocaust education program, so she reached out to the JFR for help. Though there are no authentic Holocaust sites in NYC, Erika will expose her students to the history of the Holocaust through a visit to the NYC Anne Frank Center and a tour of the Curious George Saves the Day: The Art of Margret and H.A. Rey exhibit at The Jewish Museum, in addition to their visit with Guido de Gorgey. It’s not often that we get the chance to work directly with students, so we thank Erika and the Validus Prep students for this opportunity, and Guido for sharing his story with them!